Colour: Deep and rich red colour. Aroma: Delicate notes of red currant and blackberry. Tasting: Serve it chilled as an aperitif. Awards: November 2003 : Silver Medal at the 'Saveurs du Poitou Charentes' contest in France. 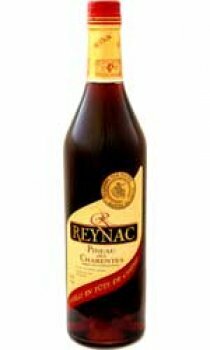 Pineau des Charentes Rose Reynac is exclusively made from red grape varieties: Cabernet Franc, Cabernet Sauvignon and Merlot give it a deep and rich colour. The translucent ruby colour of this Pineau suggests a pleasant refreshing sensation. It offers red berry aromas - cherry and blackcurrant - that emphasize its character, both elegant and luscious. When served chilled, it is an excellent aperitif or will complement starters such as melon, but it can also be quite wonderful with desserts, especially chocolate cake.